Inglesham is the most northern outpost of Wiltshire, snuggled up against the borders with Gloucestershire and Oxfordshire. Some doubt that is should be in Wiltshire at all, but the powers that be insist that it lies within the unitary authority of Swindon and so it is definitely situated in Wiltshire. Quite what the locals think of their lovely little hamlet being considered a part of dreary Swindon I did not discover. The map shows Inglesham to be a “lost medieval village (site of)”. All that remains now is a couple of farms, a handful of cottages and a very interesting church. 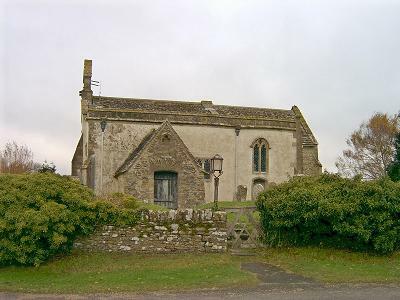 The church of St John the Baptist was restored in the 19th century in the style of its original 13th century origins. This was due to the determination and campaigning of William Morris who lived at the nearby Kelmscott Manor. (We will look at the life of William Morris in more detail a little later). It was common at that time for restorations to be carried out in the contemporary Victorian Gothic style, but Morris was adamant that this particular building should be placed firmly back in the 13th century from where it originated. After much vigorous campaigning Morris won everyone over to his view, and the restoration work was carried out accordingly. So here we have a fine building with 13th century stonework on the outside, and decorated with wall paintings and texts dating from the same period on the inside. The church also features a Jacobean pulpit and old-style box pews, including one originally reserved for his own private use by the local squire of the manor. The building today is well looked after and maintained by the Churches Conservation Trust and is open to the public on most days.